Flying cross country in the UK offers many challenges and unique experiences. In this article I have tried to summarise the action from the most successful XC season in history, so grab a cuppa and enjoy the lengthy report at your leisure. There's lots to learn from reviewing the days that worked well, and what pilots chose to do. Prizes are provided by both the XC League and its sponsors. The XC League uses the entry fees to provide trophies and cash prizes for the winners. In addition to these are special one-off cash prizes. These prizes are not specific to any year. Although plenty of XCs were flown in September and October, no more 200+ point days materialised, so the positions of the top 10 weren't affected. There was still some lovely flying to be had though. For example, Simon Green flew 131km on his Advance Omega 8 from the Malverns to near the west coast of mid-Wales on 27th September! Peggy Williams: "I had some really memorable flights during the year. Flying off Aonach Mor in Scotland and looking down on Ben Nevis from over 6000' was a real moment. Another was in early October when Graham Steel, Tim Crow and I flew 60k from Worcester Beacon across the Vale of Evesham. A couple of weeks later saw the first '100+' day, on 10th March with Phil Wallbank scoring 112 points for a 43km FAI triangle flight from Llangollen in North Wales on his Ozone Mantra M6. The competition between the Southern and Pennine clubs had started! 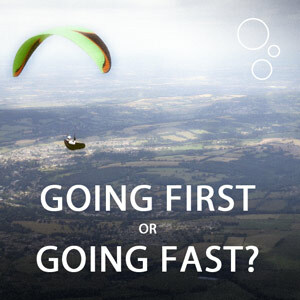 Flying XC: Going fast or going first? XC Secrets: Going First or Going Fast? Getting the most out of a good XC day often comes down to a simple decision: do you leave the hill as soon as you can (and try to stay up all day) or do you wait till it's good and blaze a trail on speedbar to cover more ground during the strong part of the day? Carlo Borsattino recounts his decisions and tactics on an epic flight from Selsely common, when his leading position on his Skywalk Cayenne 5 (EN C) was put to the test against the relentless racing of Mark Watts on his Ozone Enzo 2 (CCC). Going First or Going Fast? Having already enjoyed some of the best XC flights I've ever had in the UK spring and early summer, you might suppose that the XC monkey would get off my back and let me be. Quite the opposite, in fact! These experiences were so amazing that I just wanted more. 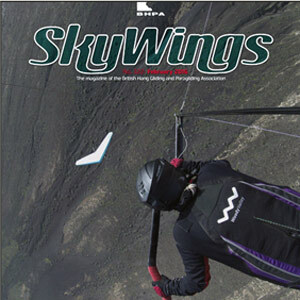 Each year the BHPA presents the Wings Over The Cloud award for inspiring writing published in Skywings Magazine. This year Carlo Borsattino has won the award for his articles: Super Sunday and If We're Lucky We'll Make Bexhill. In these articles, Carlo shares his knowledge of analysing the weather forecasts, planning a route and making the right tactical decisions to remain airborne to enjoy some extended flatland cross country flying. Each year Skywings Magazine presents the Wings Over The Cloud award for inspiring writing.